As an undergraduate at the University of Science and Technology of China, DTM postdoctoral fellow Nan Liu would overhear many of the senior members in the lab tell stories of their travels collecting samples in the North and South Poles. It was then Liu learned Antarctica is one of the best places on Earth to collect meteorites, rocks that survive passage through the atmosphere and land here on Earth. After receiving an offer from the University of Chicago to study cosmochemistry, Liu packed up and moved to the States. While at Chicago, Liu discovered her passion for studying presolar grains, or interstellar dust grains derived from dying stars dating back to before the formation of our Solar System. To her, the coolest thing she could imagine doing for a career was to hold tiny, interstellar fragments of dying stars in her hands every day. We talked to Liu about what she likes most about her field of research, and where she sees her career going in the future following her postdoc at DTM. 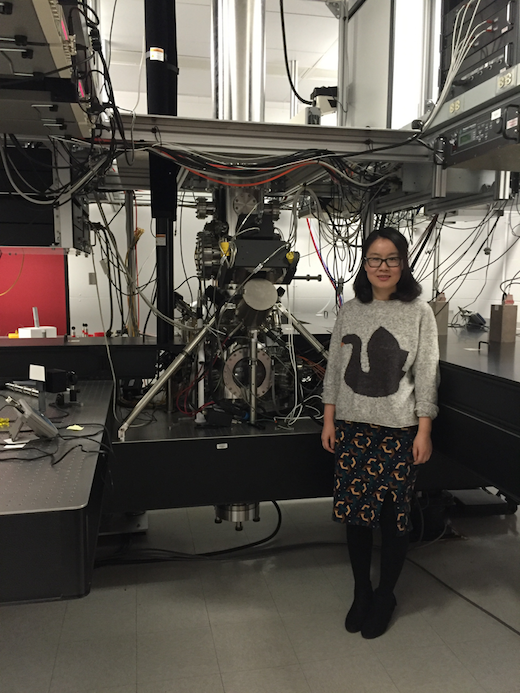 DTM postdoctoral fellow Nan Liu’s recent visit to the CHILI laboratory at the University of Chicago, where she analyzed presolar grains that had been characterized by the NanoSIMS 50L instrument at Carnegie DTM. Photo courtesy of Nan Liu, DTM. DTM: How did you first become interested in your field of research? Nan Liu: While I was an undergraduate at the University of Science and Technology of China, I did a research assistantship in geochemical studies of polar sediments. Senior members in the lab travel to the North and South Poles to collect samples every year, so I heard many interesting stories about their trips. This is how I first learned that Antarctica is one of the best places on Earth to collect meteorites falling from the sky. When I applied for graduate school, I got an offer to work in the field of cosmochemistry from the University of Chicago. So I decided to move to the U.S. and work on meteorites, like the ones found in Antarctica, there. In my first year at Chicago, I had the opportunity to discuss research papers with one of the senior professors in our group to help figure out what I wanted to work on for my Ph.D. research. After almost six months of these weekly meetings and discussions, I finally came across a paper about presolar grains, or dust grains from dying stars dating back before the formation of our Solar System. Once I learned that these grains are in fact actual materials from stars, it took almost no time for me to make the decision that presolar grains in meteorites are exactly what I wanted to work on. Holding pieces of dying stars in my own hands was the coolest thing I could imagine doing for a career. These stellar dust grains traveled to the Solar System, survived destruction in the early Solar nebula, and finally were incorporated into pristine meteorites that landed here on Earth. Each presolar grain is very small, only on the order of ~0.001 mm. Due to its small size and a limited number of atoms contained in each grain, chemical and isotope analyses of presolar grains needs to be performed with state-of-the-art instruments. For my Ph. D. dissertation, I measured isotope ratios of Sr, Ba, and Nd in single μm-sized presolar silicon carbide (SiC) grains that are mainly made of Si and C. Since each grain often contains less than 1 million atoms of these elements, to obtain meaningful isotope ratios is detailed work. It requires a mass spectrometer with extremely high sensitivity and spatial resolution that is also capable of selectively measuring elements of interest to avoid isobaric interferences. Because of these reasons, for the rest of my four years at Chicago I made many trips to Argonne National Laboratory to use their home-built Resonant Ionization Mass Spectrometer (RIMS), named CHARISMA, that is equipped with laser beams with tunable wavelengths in order to match the atomic structure of a specific element of interest for ionization. I was also involved in building a new RIMS instrument, named CHILI, at the University of Chicago that started to operate about two years ago when I graduated. CHILI outperforms the previous generations of RIMS mass spectrometers, like CHARISMA, in many ways and allows the study of the synthesis of elements in stars with greatly improved analytical precision and spatial resolution. DTM: How did you first hear about DTM? What brought you here? Liu: For my Ph.D., I focused on studying isotopic compositions of a group of presolar SiC grains called mainstream grains using CHARISMA. Mainstream grains are from low-mass Asymptotic Giant Branch (AGB) stars and are the dominant population (>90%) of presolar SiC grains. My research allowed me to derive many stringent constraints on physical processes occurring in AGB stars, and I wanted to extend such studies to grains from other types of stars. But grains from stars other than AGB stars are extremely rare (<10%), and their identification requires isotope analysis of at least C and Si isotopes using Secondary Ion Mass Spectrometry (SIMS). Since DTM has the newest generation of this Nano-scaled SIMS (NanoSIMS) instrument with seven detectors that allow simultaneous measurements of C and Si isotopes with the N isotope as a bonus, it was the perfect place for me to carry out my postdoctoral research with Larry Nittler. Also, the presolar grain community holds an annual workshop among four institutions, including the University of Chicago and DTM, so I have known Larry since the start of my Ph.D. I even visited DTM in 2014 when the annual workshop was held here. For those reasons, I knew DTM was the perfect place to carry out my postdoctoral research under the guidance of Larry. 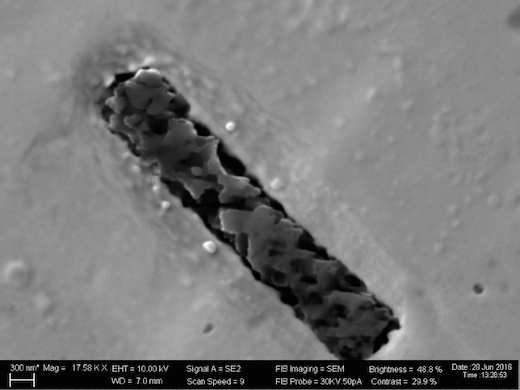 A secondary electron image of a unique needle-shaped presolar silicon carbide grain with a complicated polytype structure that is pressed into a piece of gold foil. Image by Nan Liu, DTM. DTM: What research projects are you working on now at DTM? Liu: I have developed a new method to non-destructively identify presolar SiC grains from stars other than AGB stars by collaborating with Larry Nittler, Conel Alexander and Jianhua Wang from DTM, and Andrew Steele from the Geophysical Laboratory. The traditional way to identify presolar SiC grains is to measure isotope ratios of at least C and N. But isotope analysis is destructive and implants ions to sample surfaces that might change the surface structures. Also, as NanoSIMS is a quite expensive and “delicate” instrument, so many institutions do not have the capabilities to carry out detailed studies of these rare types of grains. Thus, our developed novel method greatly reduces the expense of finding such rare type SiC grains and thus increases the scientific return of presolar grain studies. Also, such an innovative development has inspired other researchers to apply such a method to other presolar minerals. In addition, I analyzed a number of the non-destructively identified rare type SiC grains with the NanoSIMS 50L for their isotopic compositions. We found that SiC grains from supernovae, the so-called X grains, show well correlated Si and Ti isotope ratios despite the fact that supernova ejecta seems to be quite clumpy based on astronomical observations. More importantly, the observation of such a good correlation allows us to derive a constraint on the formation timescale of dust grains in supernovae. I will be presenting this result at the LPSC meeting this month. The isotopic signatures of these grains also allowed us to link several rare groups of presolar SiC grains with unknown stellar origins to a supernova origin with an extra mixing process occurring before the explosions. The constraint on their stellar origins not only implies an increased abundance of supernova grains incorporated in meteorites but also identifies new physical processes that need to be considered by modelers to improve their model predictions. I also recently made a trip to Chicago to use the CHILI instrument I helped build to measure these rare presolar SiC grains characterized by the NanoSIMS for their isotopic compositions of Sr, Mo, and Ba. These new data combined with the NanoSIMS data will certainly provide the most stringent constraints on detailed nucleosynthetic processes in different types of stars, thus allowing a better understanding of their origins and in turn the precursor materials of our own Solar System. DTM: What excites you about your work? Liu: I’m excited about the enormous amounts of information contained within each ~0.001 mm sized presolar grain, waiting to be discovered. Essentially, isotope ratios of most of the elements in the periodic table can be measured in presolar grains to constrain physical processes and detailed nucleosynthesis in their parent stars at such a detailed level that cannot be achieved by current astronomical observations. Another aspect of my research that really excites me is the combination of different analytical techniques, including different mass spectrometers, microscopies, and spectroscopy, to study presolar grains. For example, presolar SiC grains from low-mass stars and supernovae with vastly different isotopic compositions measured by the NanoSIMS, in fact, can have quite similar crystal structures measured by Raman and Transmission Electron Microscopy, though the stellar environments in these two types of stars seem to be completely different. 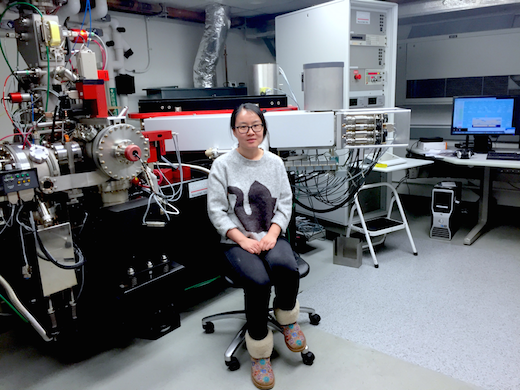 Nan Liu sitting in front of the NanoSIMS 50L at DTM. Photo courtesy of Nan Liu, DTM. DTM: What research do you hope to do in the future? Liu: I hope that I will still be studying presolar grains, using different instruments to uncover more unknown aspects about different types of stars. DTM: What do you hope to be doing at your next job? Liu: I do not have an idea at the moment. But I have been applying to academic jobs and would like to continue my work on presolar grains in research institutions somewhere. My dream is to measure isotope ratios of each element in both O-rich (e.g., silicates, oxides) and C-rich (e.g., SiC) presolar grains from different regions of supernovae using both NanoSIMS and RIMS. Nucleosynthesis in supernovae is really complicated and in different parts of supernovae, you can have completely different nucleosynthetic processes ongoing to produce particular isotopic signatures. By focusing on presolar SiC, we only get information about the C-rich regions. A complete picture of nucleosynthesis occurring in different layers of SNe is the key to constraining the supernova models to estimate the amounts of short-lived nuclides in the early Solar System from supernovae and to thus better understanding the origin of the Solar System. DTM: Where do you see yourself in 10 years? 20? Liu: A short answer is that I am not quite sure. I hope that I can find a faculty position in a university so that I can continue my presolar grain research and also inspire students with presolar grains. DTM: Any other interesting anecdotes about your life you want to share? Liu: Presolar SiC was discovered in 1987, and the most famous supernova, SN 1987A, exploded in 1987, a few months before I was born. So this year, I am turning 30 along with SN 1987A and the presolar SiC research.